NEW YORK (CNS) — With the arrival of the genial sequel “The SpongeBob Movie: Sponge Out of Water” (Paramount), self-proclaimed “nautical nonsense” is once again the order of the day. As for the suitable audience for this fast-paced exercise in silliness, kindergarten-level potty humor and some mildly frightening plot elements aside, director Paul Tibbitt’s mix of animation and live action adds up to an appropriate outing for all. Fans of the long-running Nickelodeon TV series “SpongeBob SquarePants,” on which Tibbitt has worked in various capacities, have had to wait quite a while for their hero’s second cinematic adventure. After all, his big-screen debut, titled — what else? — “The SpongeBob SquarePants Movie,” was released way back in 2004. As SpongeBob (voice of Tom Kenny) returns to the cineplex, his seabed hometown, Bikini Bottom, is thrown into crisis when the secret formula for Krabby Patties — the signature delicacy of the restaurant at which SpongeBob works as a short-order cook — goes missing. 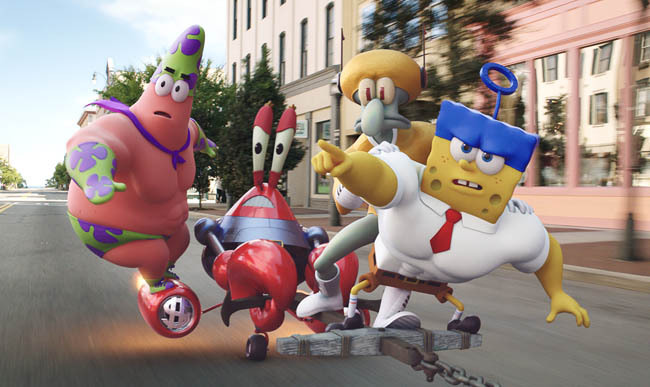 Not only does this spell potential ruin for SpongeBob’s employer, miserly Mr. Krabs (voice of Clancy Brown), it threatens to tear the whole community to shreds since the absence of their favorite foodstuff promptly reduces Bikini Bottom’s normally tranquil residents to a pack of marauding hooligans. So, with society falling apart around him, SpongeBob joins forces with an unlikely ally, his boss’ long-standing rival Plankton (voice of Mr. Lawrence), to retrieve the vital recipe. He’s also helped on his quest, with varying degrees of effectiveness, by his two best friends: dimwitted starfish Patrick (voiced by Bill Fagerbakke) and easily alarmed chipmunk Sandy (voice of Carolyn Lawrence). Since Plankton was, as usual, plotting to steal the list of ingredients at the time of their disappearance, he naturally falls under suspicion. But, in an exemplary display of fairness and truth-telling, SpongeBob, who knows Plankton is innocent of the crime, stands up for the unpopular curmudgeon. Yet doubts remain as to Plankton’s true loyalties. This gives screenwriters Jonathan Aibel and Glenn Berger the chance simultaneously to play with and to promote the commonplace screen message that teamwork is the key to success. Good-hearted SpongeBob preaches the gospel of cooperation unreservedly, but Plankton takes a lot of convincing. Further obstacles are placed in SpongeBob’s way by luxuriously whiskered pirate Burger Beard (Antonio Banderas), who also serves as the tale’s manipulative narrator. Sometimes inside the story, sometimes working to alter it from the outside to suit his own aims, Burger Beard provides the link between the cartoon world of Bikini Bottom and “real” life. Religion enters the picture, in a passing way, via Sandy’s panicked avowal that Bikini Bottom’s citizens must appease “the gods” in order to reclaim their meal of choice. It would take considerable interpretive effort, however, to translate her irrational, aimless paganism into even a veiled critique of revelation-based faith. The film contains occasional menace and a few mildly scatological jokes. The Catholic News Service classification is A-I — general patronage. The Motion Picture Association of America rating is PG — parental guidance suggested. Some material may not be suitable for children.